Wow, we made it. What a whirlwind. 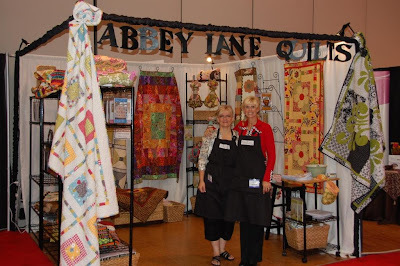 It started 2 weeks ago when I flew to Florida for the last minute sewing buzz. 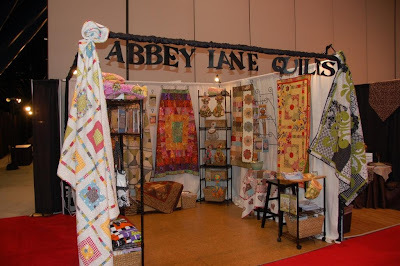 We made two purses, four abbey bags and 5 quilts. We had a week. Then, we loaded up our little red boy scout trailer, and hit the road for houston. We left late, of course, so we drove all night, except for the two hours we slept in a parking lot. Pulled into Houston about 10 am and headed for the convention center. Here is the best part, though. 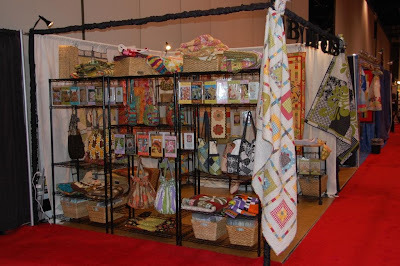 Pictures of the booth. We created this wall to show off all our bags and allow people to shop from both sides. We put up the big letters just in case any one wanted to know who we are. That is our first group of pictures. We pulled into Florida this morning at 5 am. I am flying back to Utah first thing in the morning. 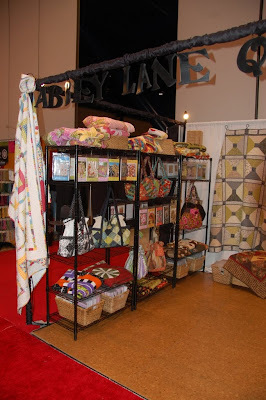 I will post more pictures of our booth and some of our favorite friends from Market. Check back in a couple of days. So much to show. Beautiful booth girls, as always. So much fun to see you both. I had no idea you had been roaming around the country while you were getting ready for market! I am working on that fab-u-lous bungalow bag of yours and can't wait to show and tell! Travel safely.